This tender, rhyming picture book is a lively celebration of love. Little ones adore being independent and trying new things. But they also need Mom and Dad’s reassurance and snuggles. With her spare, lyrical text, debut author Meg Fleming captures the exuberance, the affection, and the tender push-and-pull of life with a child. And illustrator Sarah Jane Wright’s evocative illustrations infuse the story with generous helpings of warmth and love. 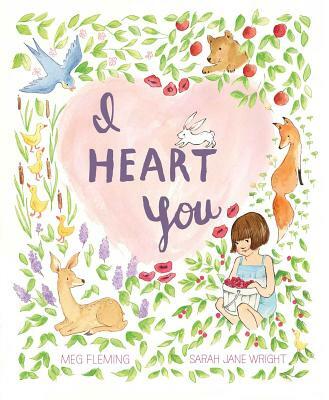 Meg Fleming is the author of I Heart You; Ready, Set, Build! ; Sometimes Rain; and other books for children. Also a voice teacher, Meg draws on her love of rhythm, rhyme, and lyricism to create and imagine stories. She lives outside of San Francisco with her husband and three kids. Visit her at MegFleming.net. Sarah Jane Wright has been illustrating the world around for as long as she can remember. She is the artist behind Sarah Jane Studios, which has a huge following on Pinterest and is a thriving business on Etsy, selling prints, wallpaper, etc. She also illustrated The Secrets of Eastcliff-by-the-Sea. Sarah Jane loves being a mom to her four small children and currently resides in Utah. A sweet affirmation of a parent’s love for a child. Starting with rabbits on the edge of a forest near a garden, readers follow several animal parents and their young through the forest. Eventually, the book comes back to the garden, where a mother and child have been working all day. The soft pencil and gouache illustrations show adorable animals playing gently. Each animal gets a quartet of three-word sentences echoing messages of love....since this title would work well for one-on-one lap reading, it may be a nice way to encourage parents and children to come up with their own three-word phrases to describe their feelings. VERDICT A wonderful choice that will be most appreciated by those looking for a tender family read. Fleming coaxes remarkable emotion out of three-word sentences in a lovely debut, constructing poetic mini-narratives involving parent-child pairs. Most of those pairs are animals: the first pages show a young rabbit racing back to the family den with a stolen carrot for a tender reunion ("I see you./ I miss you./ I hug you./ I kiss you"). A few pages later, two bears tussle before the older one serves as an ad hoc stepladder so its child can pick an apple from a tree ("I chase you./ I slow you./ I lift you./ I grow you"). Working in pencil and gouache, Wright (A Christmas Goodnight) creates an enchanting rural landscape, concluding with gentle scenes of a mother and daughter watching fireflies fill the air. Up to age 8.